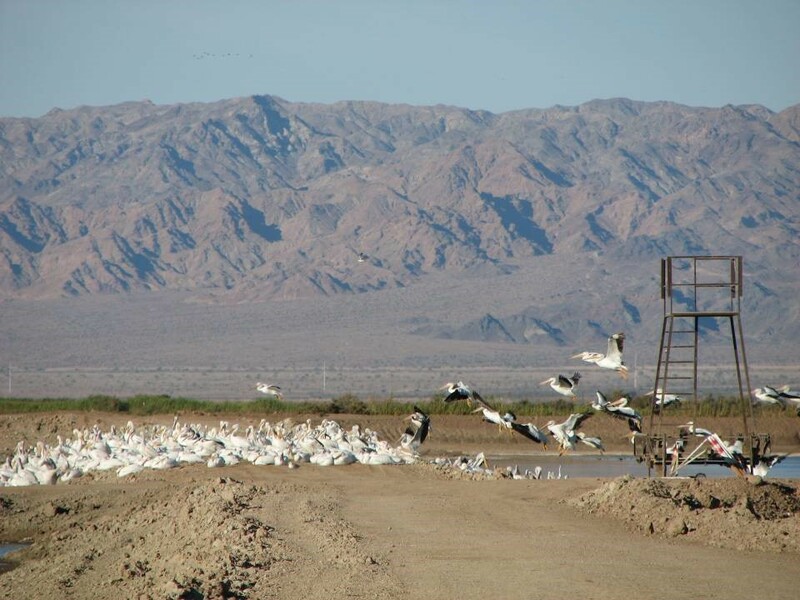 California’s Salton Sea is a fertile oasis in the hostile desert of southeastern California, adopted by millions of birds migrating along the Pacific Flyway. As California’s largest lake, it stretches across almost 35 miles in a remote, below sea-level valley in the southeastern corner of the state. Current Salton Sea information is posted below. The Sea faces a host of challenges, including a declining water supply, rising salinity, very high levels of nutrients that generate excessive algal growth and very low oxygen levels, and, to date, a glaring disconnect between the rate of change and the rate of efforts to address that change. 2017 data reflect an average of March & June samples only (note that ppt is a mass/mass ratio, while g/L is mass/volume; they are not equivalent at higher salinities). 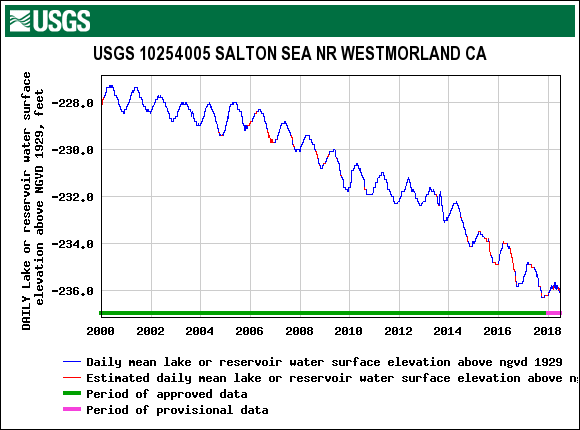 Salton Sea Elevation, Jan. 2000 – Jun. 2018. A flock of Wilson’s Phalaropes create a reflection while flying over constructed saline habitat ponds (SHP), Salton Sea, California. 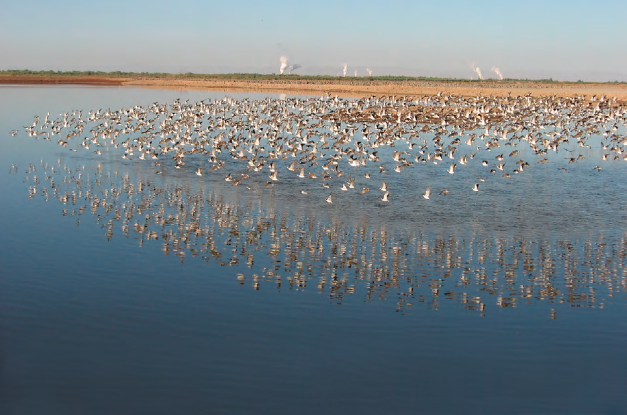 Numerous species of waterbirds rapidly inhabited the SHP after completion in March 2006, and continued to use the SHP for foraging, roosting, and nesting activities, until the ponds were dried up in 2010. Photograph courtesy of Tom Anderson, U.S. Geological Survey, Salton Sea Science Office. See Miles, A.K., Ricca, M.A., Meckstroth, A., and Spring, S.E., 2009, Salton Sea Ecosystem Monitoring Project: U.S. Geological Survey Open-File Report 2009-1276, 150 p.
American white pelicans at USGS/Reclamation Saline Habitat Ponds. Photo courtesy of Tom Anderson. 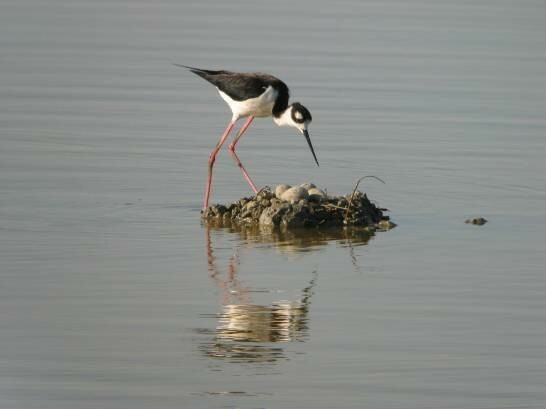 Black-necked stilt & nest at USGS/Reclamation Saline Habitat Ponds. Photo courtesy of Tom Anderson.